The church office and Child Development Center will be closed on Monday, May 28 in observance of Memorial Day. Highlands remembers and honors those who gave their lives in service to our nation, and wishes everyone a safe and happy holiday. The church office, Child Development Center, and Community Ministries will be closed on July 4 in observance of Independence Day. We wish you a safe and happy holiday! The church office, Child Development Center, and Community Ministries will be closed on Monday, September 2 in observance of Labor Day. We wish you a safe and happy holiday! The church office and Child Development Center will be closed on Monday, November 11 in observance of Veteran's Day. Highlands thanks our veterans for their service, and wishes everyone a safe and happy holiday. The church office, Child Development Center, and Community Ministries will be closed Thursday and Friday, November 28-29 for Thanksgiving. We wish you a safe and happy holiday. For information on helping with our Community Thanksgiving meal, contact Deb Welsh. The church office will be closed Tuesday, December 24 - Thursday, December 26 for Christmas. We wish you a safe and happy holiday. For Christmas Eve service information, click here. For information on helping with our Community Christmas Breakfast, contact Deb Welsh. The church office, Child Development Center, and Community Ministries will be closed on Monday, January 20 in observance of Martin Luther King, Jr. Day. We wish you a safe and happy holiday. The church office, Child Development Center, and Community Ministries will be closed on Monday, February 17 in observance of Presidents' Day. We wish you a safe and happy holiday! The church office and Child Development Center will be closed on Monday, May 25 in observance of Memorial Day. Highlands remembers and honors those who gave their lives in service to our nation, and wishes everyone a safe and happy holiday. The church office, Child Development Center, and Community Ministries will be closed on Monday, September 7 in observance of Labor Day. We wish you a safe and happy holiday! The church office and Child Development Center will be closed on Wednesday, November 11 in observance of Veteran's Day. Highlands thanks our veterans for their service, and wishes everyone a safe and happy holiday. The church office, Child Development Center, and Community Ministries will be closed Thursday and Friday, November 26-27 for Thanksgiving. We wish you a safe and happy holiday. The church office will be closed Thursday and Friday, December 24 - 25 for Christmas. We wish you a safe and happy holiday. The church office, Child Development Center, and Community Ministries will be closed on Monday, January 18 in observance of Martin Luther King, Jr. Day. We wish you a safe and happy holiday. The church office, Child Development Center, and Community Ministries will be closed on Monday, February 15 in observance of Presidents Day. We wish you a safe and happy holiday! The church office and Child Development Center will be closed on Monday, May 31 in observance of Memorial Day. Highlands remembers and honors those who gave their lives in service to our nation, and wishes everyone a safe and happy holiday. The church office, Child Development Center, and Community Ministries will be closed on Monday, September 6 in observance of Labor Day. We wish you a safe and happy holiday! The church office and Child Development Center will be closed on Thursday, November 11 in observance of Veteran's Day. Highlands thanks our veterans for their service, and wishes everyone a safe and happy holiday. The church office, Child Development Center, and Community Ministries will be closed Thursday and Friday, November 25-26 for Thanksgiving. We wish you a safe and happy holiday. The church office will be closed Friday, December 24 for Christmas. We wish you a safe and happy holiday. The church office, Child Development Center, and Community Ministries will be closed on Monday, January 17 in observance of Martin Luther King, Jr. Day. We wish you a safe and happy holiday. The church office, Child Development Center, and Community Ministries will be closed on Monday, February 21 in observance of Presidents Day. We wish you a safe and happy holiday! The church office and Child Development Center will be closed on Monday, May 30 in observance of Memorial Day. Highlands remembers and honors those who gave their lives in service to our nation, and wishes everyone a safe and happy holiday. The church office and Child Development Center will be closed on Friday, November 11 in observance of Veteran's Day. Highlands thanks our veterans for their service, and wishes everyone a safe and happy holiday. The church office, Child Development Center, and Community Ministries will be closed Thursday and Friday, November 24-25 for Thanksgiving. We wish you a safe and happy holiday. The church office will be closed Friday, December 23 and Monday, December 26 for Christmas. We wish you a safe and happy holiday. The church office, Child Development Center, and Community Ministries will be closed on Monday, January 16 in observance of Martin Luther King, Jr. Day. We wish you a safe and happy holiday. The church office, Child Development Center, and Community Ministries will be closed on Monday, February 20 in observance of Presidents Day. We wish you a safe and happy holiday! The church office and Child Development Center will be closed on Monday, May 29 in observance of Memorial Day. Highlands remembers and honors those who gave their lives in service to our nation, and wishes everyone a safe and happy holiday. The church office and Child Development Center will be closed on Friday, November 10 in observance of Veteran's Day. Highlands thanks our veterans for their service, and wishes everyone a safe and happy holiday. The church office, Child Development Center, and Community Ministries will be closed Thursday and Friday, November 23-24 for Thanksgiving. We wish you a safe and happy holiday. The church office will be closed Monday and Tuesday, December 25-26 for Christmas. We wish you a safe and happy holiday. The church office, Child Development Center, and Community Ministries will be closed on Monday, January 15 in observance of Martin Luther King, Jr. Day. We wish you a safe and happy holiday. The church office, Child Development Center, and Community Ministries will be closed on Monday, February 19 in observance of Presidents Day. We wish you a safe and happy holiday! The church office and Child Development Center will be closed on Monday, May 27 in observance of Memorial Day. Highlands remembers and honors those who gave their lives in service to our nation, and wishes everyone a safe and happy holiday. The church office will be closed Tuesday-Thursday, December 24-26 for Christmas. We wish you a safe and happy holiday. The church office, Child Development Center, and Community Ministries will be closed on Monday, February 17 in observance of Presidents Day. We wish you a safe and happy holiday! The church office and Child Development Center will be closed on Monday, May 26 in observance of Memorial Day. Highlands remembers and honors those who gave their lives in service to our nation, and wishes everyone a safe and happy holiday. The church office, Child Development Center, and Community Ministries will be closed Thursday and Friday, November 27-28 for Thanksgiving. We wish you a safe and happy holiday. The church office will be closed Wednesday-Friday, December 24-26 for Christmas. We wish you a safe and happy holiday. Join us at Rushton Park off Highland Avenue on Saturday, April 13 for an Easter Egg Hunt and fun together with the Highlands church and Child Development Center family. Games and activities will begin at 9:30 a.m. Egg Hunts by age category will begin at 10:00 a.m.
11:00 a.m. - Thank you, clean up, and good bye! Prizes for everyone! Special prizes for finding Golden Eggs! Rushton Park is located just off Highland Avenue near Independent Presbyterian Church. Street parking is available. Youth and adult helpers are needed to hide eggs and facilitate games and activities. For more information, contact Mary Elizabeth Neal. Join us after worship on Sunday, March 17 for our ongoing discussion series just for parents! The topic will be Sharing Your Faith with Your Child with Rev. Elizabeth Goodrich, Presbyterian clergy and Rev. Herb Robertson, Chaplain at Children’s Hospital. RSVP strongly encouraged; Visit www.highlandsumc.net/families to register. The church office, Child Development Center, and Community Ministries will be closed on Monday, February 18 in observance of Presidents' Day. We wish you a safe and happy holiday! The church office, Child Development Center, and Community Ministries will be closed on Monday, September 4 in observance of Labor Day. We wish you a safe and happy holiday! 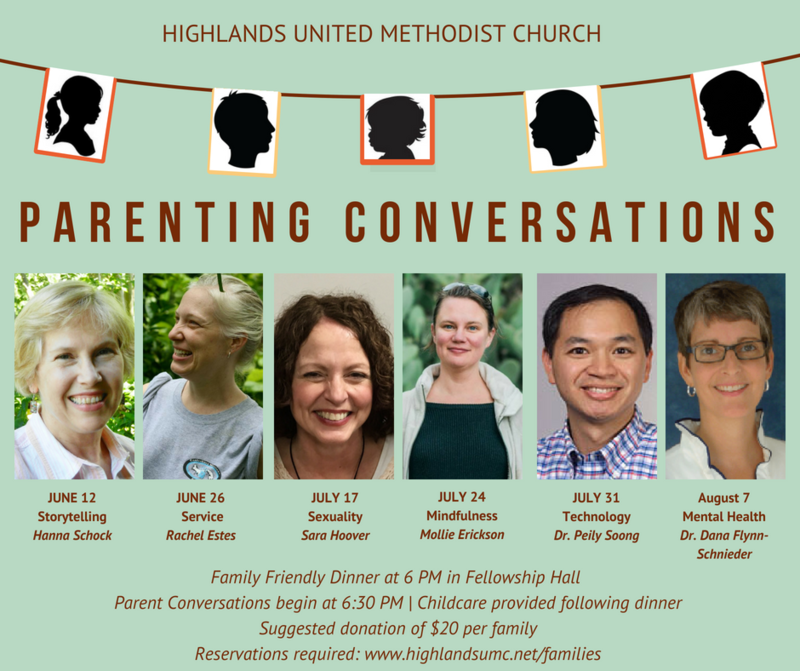 Our popular summer discussion series just for parents is back! 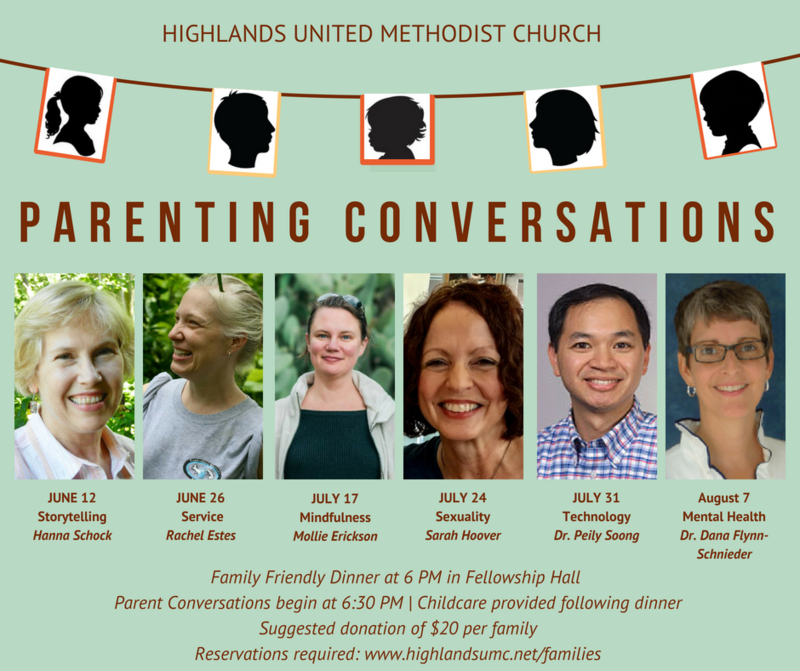 Join us on Tuesday evenings to dive into important topics for parents, no matter where you are on your parenting journey. Dr. Dana Flynn Schenider is a psychologist with Pitts & Associates in Birmingham, AL, providing individual therapy for children, adolescents, and adults; parenting consultation and strategies; play therapy for children; and family therapy. Dr. Peily Soong, MD is a pediatrics specialist in Birmingham, AL and has been practicing for 14 years. Mollie Erickson is a woman, daughter, sister, mother, friend, advocate and encourager. Her yoga classes are intentionally welcoming for persons at every stage of their practice, and are judgment free. She studied at Homewood High School, a brief stint at Birmingham-Southern College, and then graduated from Emory University. It took all that studying to learn that Success looks like Sitting Still, Listening, Managing Waste, Planting a Garden, and Always Choosing Kind Words. Mollie has a million causes she would love to tell you about, and several ideas for saving the world. She is married to Brian, and they have three amazing children (12, 11 and 5). Namaste, y’all. Sara Hoover is a marriage and family therapist in Birmingham specializing in coping skills, caring for the caregivers/life transitions, grief and loss, identity/orientation, spirituality/religious concerns, transitions in parenting (ex: adolescents to college). "Every person is unique because you bring your own history with you. While history is important, it doesn't have to dictate our future. Whether I am seeing an individual, couple or family, I know we bring with us the people who are part of our stories and it is a privilege to hear yours and hear what matters most in your life." The church office, Child Development Center, and Community Ministries will be closed on Wednesday, July 4 in observance of Independence Day. We wish you a safe and happy holiday! Rachel Estes is the Director of Outreach and Missions at Canterbury UMC and a regular volunteer with Highlands' Community Ministries. Highlands CDC loves our teachers! Clean and Clear is Five Points South's beautification and cleanup event that happens three times a year. From trash collection to graffiti removal and greenery efforts, this is your day to give back in your downtown. Clean and Clear is a Five Points Alliance program and only made possible through our sponsors and partners and the City of Birmingham. WHERE: 8am check-in at the amphitheater in Brother Bryan Park with a group orientation at 8:30am. Five Points South business district and many areas within the neighborhood are targeted for Clean and Clear efforts. WHAT: At check-in, you’ll receive your assigned cleaning area, complimentary coffee, water and snacks. All we need you to bring is the manpower and some tools. IMPORTANT!!!! We will need 3 pressure washers, some weed eaters and a lawn mower. • Sidewalk clearing and weed cutting around park. WHO: Anyone! From large companies to individuals, families with young children to college students, we’ll find a place and tasks for everyone. Sign up as an individual or gather a team. 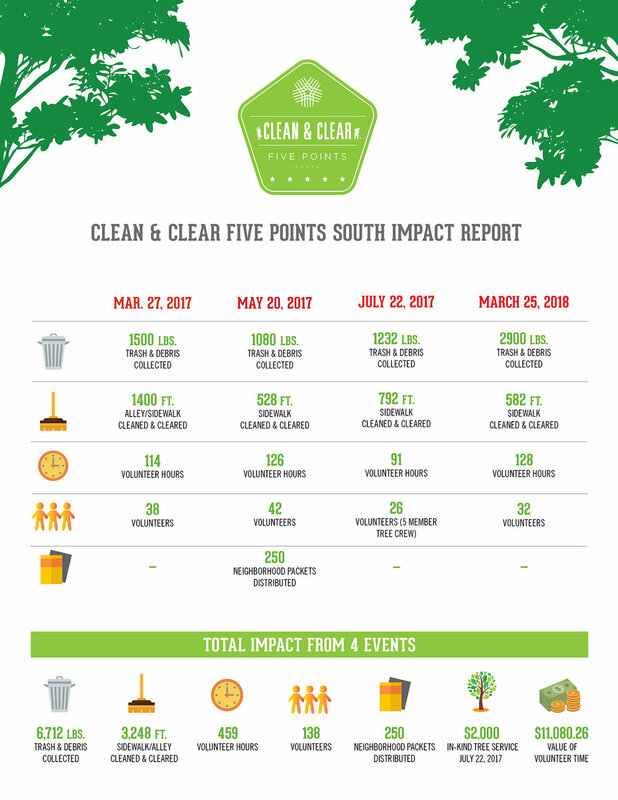 WHY CLEAN & CLEAR: Since March 2017, 138 volunteers totaling 459 hours have made Clean and Clear Five Points South a huge success. And we know that beautification efforts like Clean and Clear create a higher quality of life by attracting visitors, residents, reducing crime, encouraging new businesses and instilling pride in the city we all call home. RESULTS TO DATE: Over 6,700 pounds of trash and debris have been collected; 3,248 feet of sidewalks/alleys have been cleaned/cleared and problems with city infrastructure like vandalism, potholes and damaged bus stops have been reported. Our annual Mother's Day tradition! Join us in worship on May 13 at 10:30 a.m. as we bless and welcome the infants born into our church in the last year. All Are Welcome! Celebrate Mother's Day with the CDC! All moms are invited to the Greeting Space for some delicious muffins. Child Development Center Spring School Portraits. Contact your child's classroom teacher for more information. The Highlands Child Development Center will be closed on Thursday and Friday, March 29-30 for Spring Break. We wish everyone a safe and happy break! 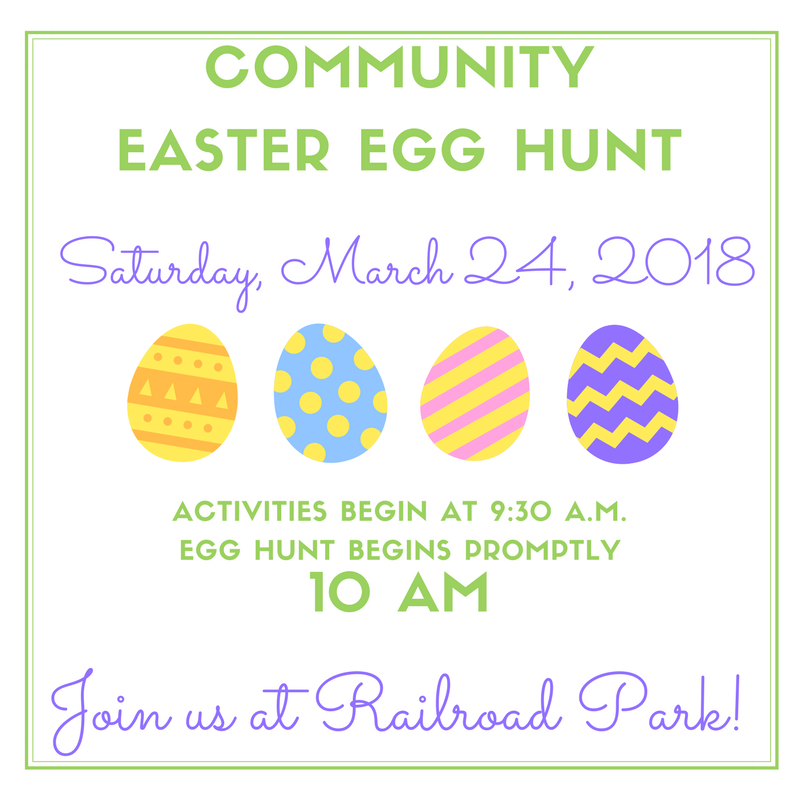 Join us at Railroad Park on Saturday, March 24 for an Easter Egg Hunt and fun together with the Highlands family and larger Birmingham community. Games and activities will begin at 9:30 a.m. Egg Hunt will begin promptly at 10! Youth and adult helpers are needed to hide eggs and facilitate games and activities. To sign up, contact Mary Elizabeth Neal. Save the Date for our Child Development Center's annual fundraiser - Lights, Camera, Auction! Join us at B & A Warehouse for great food, warm fellowship, and silent auction to benefit the Highlands CDC. Tickets will go on sale in February 2018. Contact Valerie Nash for more information. The church office, Child Development Center, and Community Ministries will be closed on Monday, February 19 in observance of Presidents' Day. We wish you a safe and happy holiday! To make reservations, email PJ Ellis at PJBE324@gmail.com by Monday, February 5 at noon. To make reservations, email PJ Ellis at PJBE324@gmail.com by Monday, January 29 at noon. To make reservations, email PJ Ellis at PJBE324@gmail.com by Monday, January 22 at noon. To make reservations, email PJ Ellis at PJBE324@gmail.com by Monday, January 15 at noon.